The festival came about from a desire to continue the growth of the new music scene in and around the area and to celebrate the towns heritage. The name is taken from Dead Dead Good Records who were founded in the town in the late 80’s and went on to be instrumental in the development of the North West Indie Scene, furthermore Steve and Andy of DDGR were keen to get involved and help to curate the festival with us. Accordingly we are proud to present the Dead Dead Good Weekend. As a grassroots festival with a cooperative approach it has been important to involve the town as much as possible, it’s been really pleasing to see how many local independent business and venues have got on board and are organising their own events to put under the DDGW umbrella. 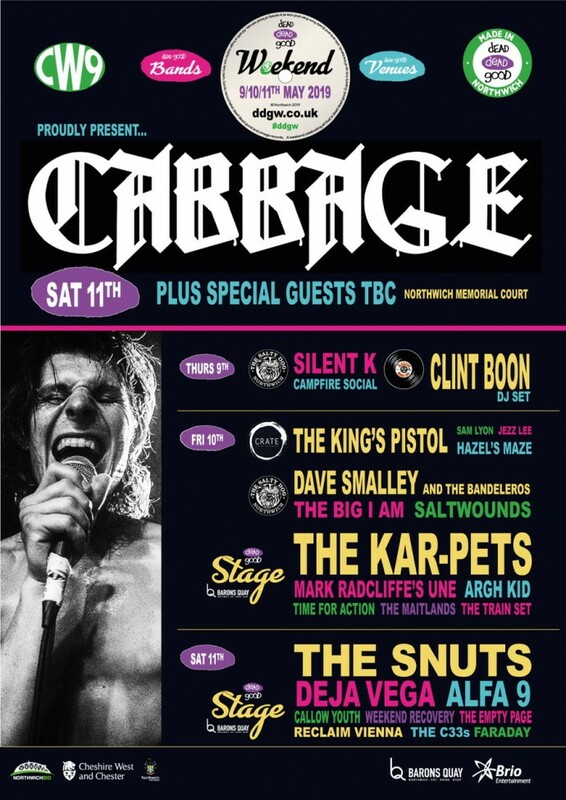 The spine of the festival is based around a number of great gigs, all culminating with a headline performance from one of the most vital bands in the country CABBAGE on Saturday 11th of May. Full schedules are attached, but here is an abridged version to give you a feel for things. Thursday we get the party started with a headline set from SILENT-K, featuring Dave Macabe of THE ZUTONS and Chris Taylor, touring guitarist for FAT WHITE FAMILY at The Salty Dog. This is followed by the one and only CLINT BOON doing a DJ set at Retros. On Friday the schedule starts to pick up speed with pop up gigs in barber’s shops and cafes and the inaugural launch of the DEAD GOOD STAGE! This is a purpose-built pop-up stage for the festival in one of the recently developed retail units at Barons Quay. Chances are this is the first and last time this space will exist for music, a good chance to say you had a great time in a place before it became a multi-storey Starbucks! Headlining this first day is the ever-marvellous TOM HINGLEY (INSPIRAL CARPETS) and his band THE KAR-PETS, the stage will start at 5pm and also features MARK RADCLIFFE’S UNE, ARGH KID, TIME FOR ACTION, THE MAITLANDS and THE TRAIN SET. Meanwhile over at The Salty Dog DISCHORD RECORDS alumni DAVE SMALLEY (DAG NASTY/ALL/DOWN BY LAW) will be performing with his new band THE BANDOLEROS. When Saturday comes, as well as being one of Sean Bean’s finest moments, is also when things really heat up. CABBAGE are the headliner of the day over at NORTHWICH MEMORIAL COURT (with a couple of surprise supports to be announced), but it’s a packed schedule all day celebrating the best in new music and showcasing the towns venues and businesses. THE DEAD GOOD STAGE runs from 12pm-8:30 and boasts a packed line up, headlined by Glasgow rising stars THE SNUTS, who are set to lay the UK festival season to waste in 2019, also featuring DEJA VEGA, ALPHA 9, CALLOW YOUTH, WEEKEND RECOVERY, THE EMPTY PAGE, RECLAIM VIENNA, THE C33s and FARADAY. There are pop up gigs in café’s, bars and barbershops, open mics, there is the NORTHWICH ARTISAN MARKET and a variety of other great activities for the whole family. In addition to this there is an exhibition MANCHESTER MADE ME, running for the duration at OBEID GALLERY, this opens on Saturday the 4th of May and runs all month. They will also be hosting a Q&A on the Saturday of DDGW at 2pm over at NORTHWICH LIBRARY, this is a fully immersive and interactive event, featuring writer, DJ and musician MARK RADCLIFFE, founder of Dead Dead Good Records STEPHEN HARRISON and Oscar and Bafta nominated director (The Voorman Problem/England is Mine) and Dead Dead Good Recording Artist (That Uncertain Feeling/The Rain Band /Monaco) MARK GILL. With extra events being added all the time, now is the time to get involved, tickets are selling fast and we have every intention of making this the first of many, so get in on the ground floor, grab a ticket and we’ll see you there for a Dead Dead Good Weekend.